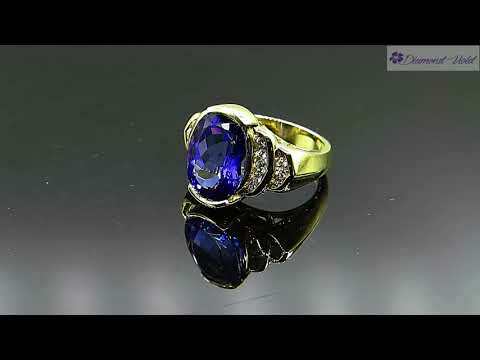 This breathtakingly beautiful Vintage NATURAL Tanzanite and Diamond Engagement Anniversary Ring crafted in rich 18K Yellow Gold (stamped) dazzles Beautiful GIA Certified NATURAL Oval Shape Tanzanite in Deep Blue-Violet color; approx. estimated as 7.50ct. The measurements are 14.27x11.06x7.22mm. Gorgeous well saturated Medium deep dark Bluish Violet color, Bright, Very Sparkly. On photos appears more blue, has beautiful Violetish Blue color in person. Tanzanites often called “Gemstone of the XXth Century”! Extraordinary, occurs in only one place worldwide. There are 16 White Round Diamonds accenting the center stone, estimated total weight is 0.70CT, G-H-I color, VS2-SI1 clarity appear Very White and Eye Clear. This Amazing ring can be worn as an Engagement ring or as a right hand ring! A Yellow Gold Band is well made. The top’s outline measurements are 16.92x22.56mm. Sits just right from the top of the finger, 8.44mm. The band tappers from 7.63mm to 4.40mm on the bottom. The weight is 15.08 grams, Solid. Fits finger size 7 ¼, can be re-sized. FREE SIZING with purchase. The ring is in good vintage condition, minor evidence of wear in form of tiny scratches to the metal. All diamonds are present and appear original, in great condition. Polished and ready to wear. Comes in the Gift Box with Original GIA certificate and an Appraisal. Please contact our customer service at (212)921-7153 with any questions.